Why Customer Feedback Is Important in Business? If you run your own business I know you do your best to please your customers, satisfy their needs, and eventually to keep them loyal to your product. But how can you be sure that your efforts bring desired results? If you do not try to find out what your clients actually think about your service, you will never be able to give them the best customer experience. Their opinions about experience they have with your product is helpful information that you can use to adjust your business to fit their needs more accurately. Here are some reasons why customer feedback is important in business. In the times of social media, consumers do not trust commercials or expert advice so much. Opinions provided by other customers who have already used a product or service are more reliable source for information these days. When you look for an accommodation in a city you visit or you want to find a nice new restaurant to have dinner with friends you read reviews beforehand. When you want to buy new shoes you ask for opinion on Facebook or go to a trustworthy blog to read a review. Many companies today incorporate review system in their services and products. Think of Uber, or AirBnb. They all do their best to ensure that poor service will be detected and excluded from their business. Customer feedback is as important to your business as to other customers, so you should make sure that both you and your clients have an easy access to opinions and reviews. Satisfied customer will stay with you. Unhappy customer will eventually find a better alternative to your business and leave. Customer feedback helps you determine if your clients are satisfied with your service and detect areas where you should improve. Thanks to asking for opinions regularly you can always keep a finger on the pulse. Each time a dissatisfied customer express his disappointment you can immediately react and find a solution to fix an issue. This is a perfect moment to win a client back and even increase his level of loyalty. In many cases, an unhappy customer who encountered a problem with your service, but you got it fixed straightaway demonstrates bigger devotion to your brand that a customer who has never been disappointed with your service. To some extent,it is not easy to find the honest and reliable supplier for your CNC Machining Parts.You need to communicate with the sales, and then check their prices and samples. 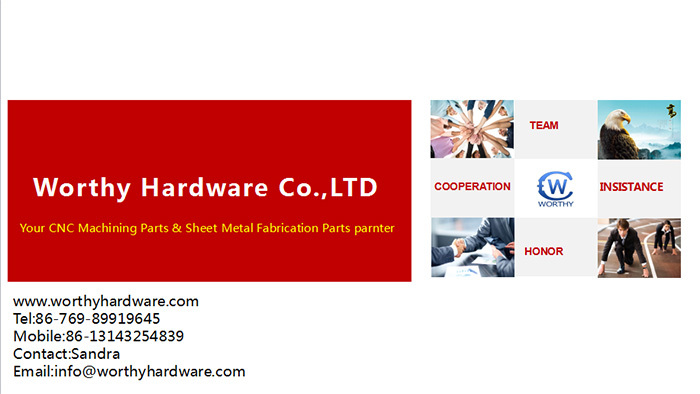 Before you approve the parts, you are in the nervous situation, you are worrying about the vendor’s delivery time, quality, especially the service.However for Worthy Hardware,ours customers will be no trouble and pressure doing business with us. We would like to attach some presentation about the feedback from our customers.We will stand behind to our customers forever!